A national bestseller, this gorgeously illustrated letterpress-inspired book combines feminist history with a vision for a better future. Dead Feminists is a lushly illustrated and inclusive celebration of inspiring women who transformed the world and created social change. Based on the beloved letterpress poster series of the same name, Dead Feminists interweaves intricate broadside art with archival photographs and ephemera. This book brings feminist history to life, profiling 27 unforgettable forebears of the modern women’s movement such as Eleanor Roosevelt, Gwendolyn Brooks, Rachel Carson, and more. Across eras and industries, passions and geographies, this collection of diverse, progressive, and perseverant women faced what looked like insurmountable odds and yet, still, they persisted. Dead Feminists, which features a foreword by Jill Lepore, author of The Secret History of Wonder Woman, is an illuminating and innovative reminder that women can be extraordinary agents of change. The future is female, but in many ways so is the past. Dead Feminists takes feminist inspiration to a new level of artistry and shows how ordinary and extraordinary women have made a difference throughout history (and how you can too). 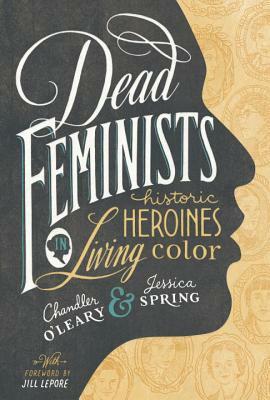 "Fierce, feminist, and forceful, the fascinating words and incredible historical images in Dead Feminists brings the stories of these women to life like never before." "The latest in a series from Jessica Spring and Chandler O’Leary." “Pioneering women and 21st-century illustration: now there’s a cool combination… an illuminating look at 27 brilliant women… the words and deeds of each are examined, alongside archive photographs and gorgeous posters." "A new and illuminating look at 27 women who changed the world." "Each feminist is chosen with such care—and each woman’s story connects to current events. The articles are brief and the art is stunning." "The book...enhances the broadsides with added art, expanding the profiles of 27 “women who changed the world." "Bolster those bookshelves with some quality reading material." "From the moment you turn back the cover, you are immersed with the images of women designed in what you will come to know as O’Leary and Spring’s artistic styling." "If you want a good coffee table book that also happens to be a great read, definitely check Dead Feminists out." "Chandler O'Leary & Jessica Spring have chosen [these] remarkable women to honor… I am so pleased and proud." "A gorgeous new book of feminist history." "This richly illustrated letterpress-inspired book combines feminist history with a vision for a better future… takes feminist inspiration to a new level of artistry and shows how ordinary and extraordinary women have made a difference throughout history (and how you can too)." "It’s hard to know what’s more awesome about the Dead Feminists series: the fact that the project enshrines the wisdom of feminists from bygone eras, or the fact that the resulting hand-drawn letterpress prints are so gosh-darn splendid to look at." "This beautifully-illustrated letterpress hardcover weaves drawing, photographs, artifacts, and text to tell the story of 27 pioneers of the women's movement from Sappho to Eleanor Roosevelt to Shirley Chisholm." "This book began as a series of hand-drawn letterpress broadsides featuring quotes from, well, dead feminists. Those images are collected in this beautiful book that also features biographies and artifacts from the lives of trailblazers." "It had us at letterpress." "Will allow you to catch up on all of the amazing women that deserved to be in history books, but often weren't given their due." "A wonderful source of women's history." "Shedding light on some excellent women throughout history... whose accomplishments have been snatched from them." "Includes stunning visuals placing an artistic spotlight on inspiring women through the ages and their struggles and victories." " A glimpse into the history of feminism, from the words of members of the early feminist movement themselves." "An exhilarating excursion up and down the timeline of what, since the 1970s, is sometimes called herstory." "An inspiring and informative project." "[The] lively visuals bring history to life." "Perfect in every way! I just love the way that they’ve done this, and I haven’t seen a book quite like this before. This would make a fantastic gift—it needs to be shared because it’s just so great."